You also get incremental search within the results, so you can focus the results and then type the first few letters of a filename or folder name to jump directly to it. When the Hit column gets narrow, the context shrinks so you can still see the hit text properly. 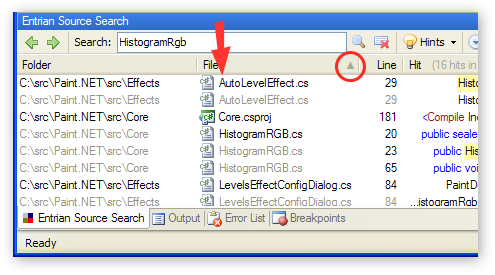 When the Folder column gets too narrow for the folder pathnames, the pathnames are now truncated from the left rather than the right, leaving the most important pieces visible. The tooltip for truncated items in the results list no longer times out (thanks, Grammarian). Added a workaround for a bug in early versions of .NET 2.0, which could cause an ArgumentOutOfRangeException when searching (thanks, Eldad). As always, the upgrade is free for licensed users, and there’s a free 30-day trial for everybody else. Download here! Spaces are ignored when searching, so searching for x=1 (without spaces) will find x = 1 (with spaces). As usual, you can download this latest release from the download page.